This is the day! This is what we came for. With my red shirt on and my wife donning a white shirt with a bicycle print on it (a bad sign? ), we readied and waited for 11 am. 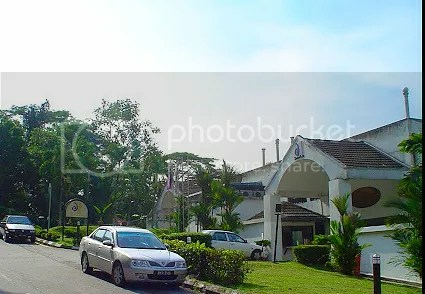 It’s our shuttle’s pick up time (we paid a return trip to and from Sepang, which costs us RM100 each). 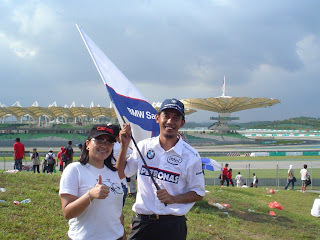 We will be on our way to Sepang F1 Circuit for the much-awaited race. We will be sharing the ride with other hotel guests – a German father & son, Indian couple, & a Filipina with two of her sons. The trip took us a couple of hours before we reached the area. The road to the circuit was jam-packed with cars, taxis and buses. On that day, almost all roads lead to F1. And with the blistering sun worsening the wait, other cars had to pull over to cool off; Others had to roll down their windows, as air-conditioning seems futile. 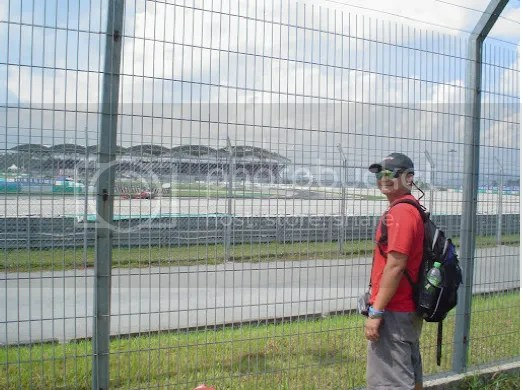 Good thing we had a proud Malay driver giving us insights of their race track, making us more eager to get out of the van and have the race started in front of us. Despite the confusion and uncertainty of our time of arrival, the sight of uniformed fans (also stuck in traffic) wearing the dominant red Ferrari, blue and white BMW, & yellow and blue Renault team shirts gave me goosebumps all over. It’s race day indeed. Eventually, we arrived at PC3. This is where we had to take an approximately 100 meter-walk to the C3 entrance. Along the way, we sprayed ourselves with sun block lotion – a must on this hot event. Our ticket is free seating (or standing), which makes it more compelling to do so. After another hour of waiting (and watching some of the pre-race programs), we finally heard the roar and whine of the F1 cars during the pre-warm up lap. I was shooting a video and was about to say a couple of insights & introduction, but the excitement and delight of seeing the cars drove by got me teary-eyed and felt a lump on my throat. In the end all I can utter is “Finally!”. As the Star Sports hosts on TV would say, “…the five lights illuminate…the lights are out…the race is on…”, the race started with the two Ferraris on the front row. Unfortunately, it changed all so quickly that by the time it passed turn 8 which was at our right, one of the Mclarens already started gaining some distance from the two Prancing Horses. At this point in time though, we actually didn’t care yet. The rhythm of the 20 cars passing in a blur in front of us is just music to our ears and pure spectacle to our eyes. By the middle of the race it became clear who is winning this one. It was a bit disappointing to see our favorite team trailing behind the two Mclarens that at some point I heard my wife shouting an cheering for another team. She’s turned into a double agent. At the end of the 56 laps the race winner, in order, was Alonso, Hamilton and Kimi. After the all the finishers were done with their victory lap, the crowd at C3 started packing up (and sadly, leaving most of their thrashes behind). It is pointless to stay, the awarding ceremony is out of sight. The Mclaren fans holding their flags up high, the Ferrari fans down. My wife didn’t care anymore. No point crying over spilled milk. She actually posed in front of a couple of team flags as souvenir for this race. We met up with the rest of the Duta Vista guests at PC2. The Indian couple’s the lucky one this time. Their team won and somehow, we had fun reviewing the race while our van was crawling at the traffic once more. We arrived at the hotel by past 8 p.m. Finally! F1 Sepang Tickets at last!!!!!!! (Pardon the exclamations, but it’s been our much awaited event for this year). Since my wife and I fell in love with this fast paced sport, we’ve been dreaming to see it live. So last year I was thinking that if ever we’d have to get out of this country for a vacation together, it would be the best place and time to do so. I just don’t know if she’s been thinking that way too or even ahead of me. I just know she’s been dying to see either Michael Schumacher or Kimi Raikkonen in person, win or lose. And eventually when I blurted out “we need a vacation abroad”, there was no contest, no protest – F1 Sepang is it. Disneyland is out of the picture. And today, after a couple of months since we purchased the tickets online (and doing some blunder on the transactions) and after all the anxiety of waiting for it to be delivered, it’s now in our possession, in pristine condition. Those guys (esp. 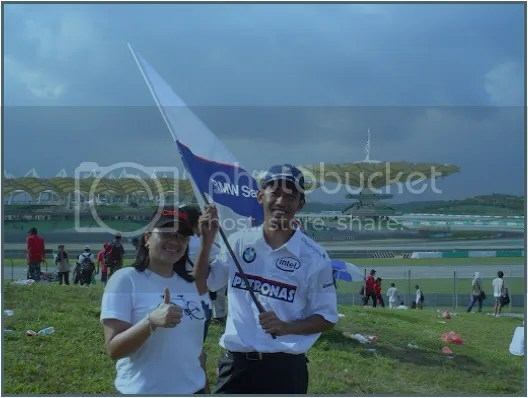 Muna) at malaysiangp.com did a very good job.